• Find out which systems support the functions that matter most to your operation. 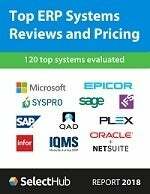 • Get a comprehensive list of the key requirements for use in your software evaluation and vendor selection. • Easy pricing: Get recommendations and pricing for solutions matching your business needs. SelectHub is a cloud-based platform for Technology Selection Management (TSM). The platform provides competitive solution analysis across key selection criteria and vendor data. These built-in analyst ratings are combined with subjective user ratings in on-going selection projects to create SelectHub ratings reports. Want help with your shortlist? Connect with SelectHub to expedite your ERP software search with free recommendations and pricing based on our expert software evaluations and inside pricing knowledge.